All the drivers must be at least 21 years old. Renter or driver(s) named in the contract must be in possession of a valid driving licence for at least 3 years and valid passport. The driver and the second driver (10 EUR per day, max. price - 40 EUR) must be named in the contract, and must agree the "General renting conditions".The minimum rental period is one day, 24 hours from pick-up time. Rental rates include unlimited mileage, liability and casco insurances against breakage and robbery (CDR&TP), oil and maintenance. 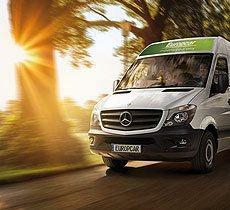 When ordering, please, contact the Europcar office for further information. Rented car may be returned to any Europcar offices in the country free of charge. In case of returning the car abroad one-way fee must be paid, which varied by countries, and special conditions and restrictions might be applied. For further information, please, contact the Europcar station. Weekend rate is valid from Friday noon until Monday 9:00 AM. In case of delayed return the standard tariff will be applied. This special rate may not be combined with any other rates or promotions, it is non-discountable and no one-way rental is allowed. 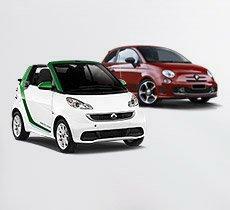 Reservations are confirmed for category, and the specific type of car can't be guaranteed. At reservation, please, give your personal data and rental information exactly (rental period, category, extras, delivery and collection, travel to abroad etc.). Rental rates include the liability and casco insurances against breakage and robbery (CDR & TP).There are two types of insurance provided by Europcar Armenia- standard and full packages. With standard insurance package, there is a deposit of 120 000 -200000AMD depending on rented vehicle group.This sum is the amount of maximum liability and presents the maximum risk of the tenant. With the full insurance package there is a charge in the amount of 7000 AMD and the maximum 50000AMD during the whole rental period. The number of extra drivers depends on the capacity of the car. For example, if your car seats five people , you can have up to five drivers. And an additional charge is raised for each additional driver. Must have a valid driving license( for at least 3 years) and experience of driving a car for at least 1 year. 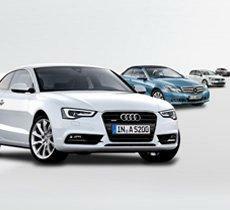 The renter is obliged on request of Europcar to notify the name and address of all drivers. The drivers are agents of the renter. Here are some rules and regulations that you should know before start driving in Armenia. The following speed limits apply in Armenia. On the highways the speed limit is 110 km/h, in settlements it is 40 km /h, and in the country - 90 km/h. The law is strict for the use of alcoholic beverage. In addition to the fine, there could even be a deprivation of the driver's license. You can use the phone only if it is equipped with the "hands-free" system. Unlike European countries, in Armenia seat belts are compulsory only for the front seat occupants. The rear seat occupants may not wear them. The law is strict in case of incorrect parkings, because they cause serious traffic accidents very often. That’s why the fines for wrong parking have been increased quite significantly (20 000 dram for an improperly parked car). ONLINE RESERVATION - Book now!